"I feel so happy, I feel so glad. I could have ever had!!" - a re-imagining of 'Changes' by Black Sabbath. Hello everyone, I'm Louise - Vanilla Ink's new creative apprentice and I'll be posting a blog every Friday to chart my progress as an aspiring jewellery maker over the next 12 months. (Please ignore that the first blog was posted 3 days late). I'll be writing about my time in Vanilla Ink, the new skills I'll be acquiring, reflecting on what I've learned and all the fun stuff in-between. Hopefully you'll forgive my ramblings and lack of good grammar, I'll write as candidly as I can to make up for it. So, from being a skint, unemployable ex-student for way too long to becoming Vanilla Ink's first jewellery apprentice has been a huge confidence boost to say the least. Previous soul crushing jobs of mine were made up of pushing sales on the unwealthy, being hounded by managers leaning over my shoulder passively demanding ridiculous targets, facing computer screens day in, day out with minuscule toilet breaks as well as many of angry phone calls from customers who seemed to only ever want to complain about how terrible their bank was or how they couldn't understand my 'thick Scot's language'. Fast forward some perils and revelations later, I now come to work to get creative! Out with the over ironed business attire and in with the new old work cardigan and Vanilla Ink peenie. My new bosses are artists and they speak my language. I still don't know how I got so lucky as to get this apprenticeship. My friends and family kindly say its due to my skill, time studying and hard work - which of course I won't argue with but I am aware of how difficult it is to find a creative job within the craft sector. Most of my creative friends still don't have work never mind creative work. So, after a semi decent/semi disastrous interview I got the call offering me the apprenticeship. Me, who had next to no jewellery experience and who had been out of work for over 2 years had got the coveted apprenticeship. I beamed, laughed and jumped for joy for over 2 days after. Then went into panic as I was to start the approaching Monday and couldn't even remember to make a packed lunch anymore. But there's nothing like just getting straight into something you're anxious about. Working with fellow artists is so different than my time working as a banking customer advisor or insurance claims administrator. And yes, both jobs were as boring as they sounded. Not only were these jobs boring but also had a huge impact on my mental health. But now, no longer do it dread going into work. I now have two amazing artists, jeweller entrepreneurs as my bosses who just happen to speak my language, Art. They also easily understand my 'thick Scots accent'..
For anyone who doesn't know of Vanilla Ink, co-founders and directors Kate Clifford and Scott McIntyre, they are wonderful, inspiring people. I don't regularly meet or come from a place that boasts enthusiastic, aspiring and inspiring talented creators. I've been catching myself just watching them and trying to visually take in what they do and learn how they manage to do it so well. They are the creative influences I never had, I now christen them my 'work parents'. Ring making from the first 2 days at VI. But I guess that's why I'm actually here, to learn and live the jewellery business. It's only been 3 days so far but so far, those 3 days have been filled with so much fun and stimulation. 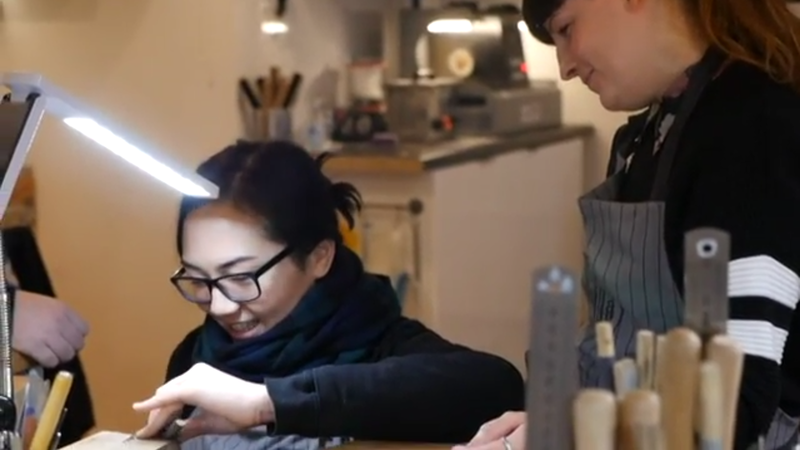 Getting to manipulate metals and create items in a fresh, bright, welcoming environment while having two incredibly talented jewellers give me their valued combined 20 years + knowledge and experience definitely seems like a privilege. I certainly feel like reaping these benefits and making up for all those years stuck in an office behind a computer. All I can think about is how much I'm going to learn and be able to do in the future. How valuable everything from making a piece of jewellery to learning how to run a business will be in my professional and personal life. I look forward to continuing to soak up every piece of knowledge and advice my two new work parents give me. I look forward to getting to know and having a great working relationship with like-minded creative talents. I look forward being able to create, to design, to make people happy, helping others to create and be happy. And most of all I look forward to just enjoying everything I'll get from this wonderful opportunity. "What you do to one side, do to the other." Saw blades can break very easily.